Strong, enduring results are almost always rooted in great organizational culture. Culture Check: Understanding the root causes of cultural conflict is critical for finding an optimal solution. Our Culture Check gives organizations a clear-cut diagnosis across multiple dimensions of cultural health, and includes a comprehensive set of action steps for improvement. Contact us for an assessment of your needs and a detailed overview of our services. Culture Coaching: Sometimes an individual, a team, or even an entire organization needs outside guidance to correct ingrained cultural challenges. We’ve assembled a talented team of specialists to provide culture coaching that restores relational health in organizations. Contact us for an assessment of your needs and a detailed overview of our services. Culture Training: Healthy organizational relationships typically stem from the quality of communication and collaboration. Through a wide-ranging series of training programs, we equip workers at all levels, and in all industries, to build productivity through healthy relationships. Contact us for an assessment of your needs and a detailed overview of our services. 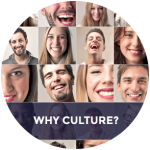 Culture Certification: Organizations taking our Culture Check, scoring well, and prioritizing ongoing cultural formation, receive a designation as a Certified Corporate Culture. This certification is available for organizations of all sizes, and across multiple locations. Contact us for an assessment of your needs and a detailed overview of our services.